Clear female voice speaks the individual numbers. Built-in volume control. 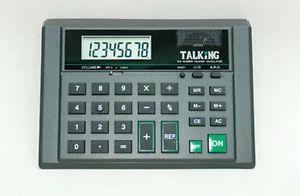 Features a large 8 digit LCD readout with numbers that are 5/8"; high. The calculator adds, subtracts, divides, multiplies and calculates percentages. Uses 2 AA batteries - Not Included.